Last night after I went to prayers downtown, I met the boys and some of the young faculty members from SFB and surrounding schools at this remote bar and grill on the outskirts of town. Our friend Rehema had invited us to hang out with all of them for our final Friday night in Kigali, and it turned out that this was a sweet karaoke place! Although I absolutely love to sing, and have been fortunate to have grown up performing with choirs around the world, I get incredibly nervous to sing in the presence of small groups of people I know. It's quite terrible actually: put me on a stage or in a stadium with huge crowds in front of me, and I can release my inner diva, but around friends in a well-lit setting, I'm too shy! Therefore, I've never actually gone to a karaoke place, as I've always been too timid to suggest it when we're going out with friends, and would be too nervous to volunteer to sing! Nevertheless, I was excited to be there, and it was a really nice, accepting atmosphere. (It was also extremely dark as it was outdoors, and one could hardly see anyone's faces, which was a bonus!) Patrick and Regis joined us as well, and we all submitted song requests for each other. It was a cool system, which I assume is quite standard for karaoke places, but it was such that we'd be eating and chatting, and all of a sudden one of our names would be announced to go on stage. Rehema, Raphael and I sang Maroon 5's This Love early on in the night, and Jamie, Chris and I were called up to sing (yell) Journey's Don't Stop Believing. We were pretty terrible up there, but the three of us had so much fun, and we were totally fine making a fool of ourselves! There were some awesome dance tunes and salsa songs that were sung, and we all enjoyed dancing around our table. Chris even taught all twelve of us at the table one of the Soph dances from Western, and we for the first time all trip, we actually enjoyed the stares from around the restaurant. Later on in the night, I was called up to sing Adele's Rolling in the Deep. I was so nervous, but thankfully I've sung this song in concert before. The guys reassured me that they were the only people I'd likely ever see again from this bar, and that I should just be confident and give it my all. And I did! It took me a verse to get into it, but after that, my inner diva started to shine through, and it felt great. I think I may officially be a karaoke supporter now… What a fun night with friends! Today, as per our standard weekend routine, we all slept in. Patrick came by at around 12:30, and he and Chris left for a weekend adventure. I got started on another physics lecture, and Jamie rested some more. In the afternoon, we got ready, and the two of us made our way to town, by moto! My driver was another weaver, darting in, out and around cars, but he was very much in control of the bike, and we saved a lot of money by skipping over a taxicab for today. 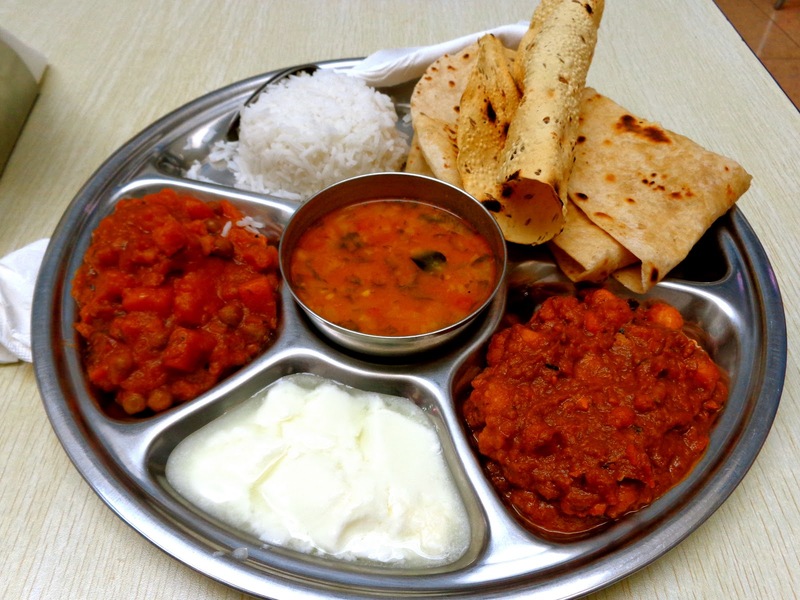 We had lunch at the Kigali Tower food court, the place in town most closely resembling a Western mall, and I tried the Thali from Khana Khazana, a famous Indian restaurant from across town, which also has a food court establishment in the Tower. It was really delicious, and a nice change from our standard rice and beans meals from on campus. After lunch, Jamie went home to rest some more, and I treated myself to a manicure at a relatively high end salon. Walking in, I felt like I was stepping into a movie set. This place was bursting with "fabulousness!" So many ladies were sitting on red leather couches lined up around the pink walled salon, waiting for their hair to be done. The three hair stylists were all men, and they were so fast with their hands, weaving braids, flat ironing, and curling women's hair. Dozens of women were getting manicures and pedicures around the shop, and the combination of hair products and heating appliances left a hazy cloud in the air. It really was neat being inside, and my nails look great! For around $7 US, I'd say it was a great experience! Thankfully, I found the Jamat Khane in time for prayers, and enjoyed being welcomed by the familiar faces. Sameer, a member of the congregation who went to school in Toronto but moved back to Kigali a few years back, and his mother, were giving me a ride home, but insisted that I come over for dinner first for some home cooked food. We stopped at Hotel des Mille Collines for some drinks, and the live band was tremendous. We then made our way to their home, where they spoiled me with a wonderful home cooked meal. We had freshly fried samosas and a number of delicious African Indian dishes. We finished off the meal with some Haagen Daaz ice cream, before Sameer dropped me home. During our meal, Sameer explained to me how his mom loves bringing home the students/young professionals from abroad, as she wants to ensure we all feel at home. She chimed in, saying that if her daughter was travelling, she would also appreciate having someone there looking after her, so in essence, she treats us like her daughters. It was really very sweet, and I'm very grateful for their hospitality. 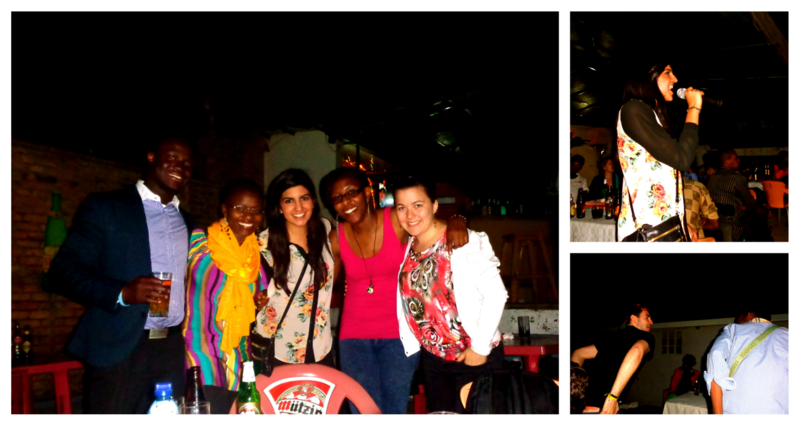 Honestly, everyone in Kigali from our community is so generous, and they have all really made me feel at home. Kigali certainly has become a second home, and I will be sad to leave in just two days time. It has been an amazing experience, and I am so thankful to have met such wonderful people. I will definitely cherish forever the memories from my many adventures here!